The other day a lovely package from Kristin at IKO IKO (totally hitting up on the next LA trip) arrived and ugh, so much perfection. These beautiful floral leggings and tote, which incidentally both match this collage I made some time ago perfectly! OBLIGATORY CREDIT IS OBLIGATORY. HOPE YOU'RE HAPPY, GRACE. Anyway, yes, I wore them right away to see Star Trek (for the second time, natch) with a couple friends and eat massive amounts of ice cream sandwiches and cheerios. I changed into this after the movie but tried to dress kind of futuristic going to see it, just to show some respect for the GQMFs. Wish I'd gotten a better picture of the shirt I cut off a thrifted dress; it's an easy fabric to shape so I tried making it all spacey. I actually took these today but whatevs. 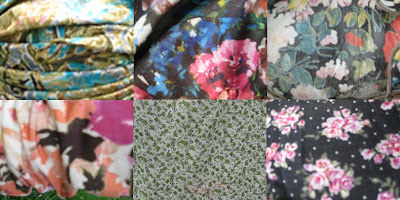 I'm sorry Christopher Kane, I rather like florals! The turban is so epic, I bought it that day at this antique store which I've been visiting over and over again for seriously months gazing at it. Finally we were on the store's street and I just ran ahead those slowpokes and into the store and bought the turban without thinking twice. Cost me 24 bones, more than I like to spend on clothes but I couldn't find another turban that even came CLOSE to how great it is in any store or online and I JUST CHANTED TORAH GODDAMNIT so...that is my logic. Will get a picture next time I wear it which will be very soon. So, clockwise from upper left: vintage turban, thrifted shirt, vintage Docs via eBay, childhood closet dress, Rowena Sartin tote and leggings from IKO IKO. These gifts came in this lovely fabric bag that I tied in a bow and wore today, which brings me to my next obligatory life-altering story of hanging out with Spencer! K SO, first we were good little //alt// kids and went to the music store and bought records (I would be pretentious and name them but I feel hipster enough having just lugged around 2 Lomo cameras and buying a copy of The Virgin Suicides [writing that here will surely bring an interesting new readership to this blog, probably not unlike the middle-aged man that asked me if me or my mom put the bow in my hair while in the checkout line at Walgreens. Srsly gtfo.] so ALLOW ME TO REFRAIN from telling you about my Juno-esque tastes [still don't know if I consider this good or bad] and just spam this post with parenthesis and brackets and run-on sentences instead.) I think he was talking. Then we came back to my house because I need my Nesquik and to show him my shrines (for what I will not say because restraining orders on geniuses are not fun) and went to a few other stores. Borders, Walgreens, the antique store where I got my turban to try on pretty hats, and a fun local store. We bought postcards and kid drugs! Razzles, giant pixie stick, that candy where you can actuallyeatthewrapperomg, and candy cigarettes. I HAVE A PIXIE STICK. YOUR ARGUMENT IS INVALID. ....I LOOK LIKE MIKEY FROM RECESS. YOUR ARGUMENT MIGHT BE VALID. So many cameras! Ok we're kind of hipsters just shut up T_T I may fail at having a brain but Spencer fails at something much more vital to living. Is that one cent difference REALLY necessary? Just had to share. We talked about teh interwebs, blogs, you, your mom, your cat, school, summer, camp, when people from school start going to your summer camp, writing, fashion, Mama Rei, music, Anna being obsessed with The Pixies, teevee, fetuses with laptops, Dave Eggers, and, once again, your mom. CASE IN POINT: Florals are awesome, so is Spencer! Today was full of lol and win.